The Esoteric School is the primary vehicle for personal transformation of initiates of the Sufi Order International. Individuals are asked to establish a relationship with a spiritual guide, who has been trained and empowered by the Pir. Within the context of this relationship, the mureed (student) is given a "prescription" of spiritual practices intended to facilitate the emergence of qualities lying dormant beneath the layers of personality and habitual thinking. The goal of the mureed is to identify experientially a source of inner guidance to the realization and fulfillment of his or her unique purpose in life. Initiation on a spiritual path signifies one's desire to undergo a spiritual training. Those who do not elect to make this formal commitment, however, are fully welcome to participate in the teachings and programs offered by the Sufi Order. Those who choose to mark their commitment by initiation are known as mureeds (students). 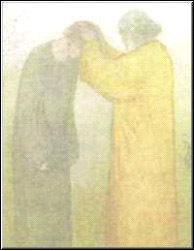 Initiation into the Sufi Order demonstrates one's sincerity in entering the Sufi path, strengthens one's powers to do so, and confers a blessing upon the pupil which enables progress. This initiation is the linking of the individual Sufi student with the chain of masters and teachers stretching back through the ages. The link so formed is of lifetime duration and forges a solemn bond, similar to the practice of baptism. One may be initiated into the Sufi Order by one of its Representatives. Those interested in initiation are encouraged to select a Representative with whom they feel a deep trust and respect, for those qualities are necessary to facilitate the training offered. The Initiate receives spiritual practices from her/his initiator which are designed to promote spiritual realization, facilitate the unfoldment of his/her being and assist in meeting life's challenges and demands. The practices are not compulsory, but are given as a gift. A mureed in the Sufi Order is welcome to be initiated into other esoteric traditions such as Tibetan Buddhism, Hinduism, or other Sufi Orders. However, it is advised that a student receive his/her daily practices from only one guide and consult the Sufi Order guide about practices he/she is doing from other Orders or traditions. The intention is to safeguard the well being of the student, so he/she is not confused by mixing practices that may not be complementary. The Sufi Order International is not a "guru-centered" school; no one is considered infallible, and guides are discouraged from giving mureeds advice about their lives, focusing instead on the method of contacting inner guidance, or the mureed's own insight, to deal with his or her problems. Guides are held accountable to a published set of ethical guidelines. The Sufi Order's Esoteric School currently offers two programs in Toronto: the Way of the Heart classes, and the mureed (and mureed candidate) Study Circles. The Way of the Heart is an experiential class that explores the universal Sufi teachings of Hazrat Inayat Khan primarily through chant, meditation, sacred readings and movement. Each evening features several of these spiritual practices, which for centuries have been used to achieve personal transformation and Divine enlightenment. The Way of the Heart is suitable for those new to Sufi work, as well as providing deeper opportunities for more experienced students. The mureed Study Circles are a primary activity for initiates of the Sufi Order's Esoteric School or other Inayati orders, and focus on breath, concentration, sound, light and meditation practices and the study of esoteric papers. Also within the Study Circles program are Candidate Classes for those considering initiation. Please visit our pages for the Way of the Heart or the mureed Study Circles for more about those opportunities. For other information about the Esoteric School, you can write to us using our contact form, or registered website members can post to our Esoteric School discussion forum.